Being born into a slum community in India as a female is not very promising of a hopeful future. 17-year-old Komal Narayankar has been surrounded by people her whole life telling her “no” because she will be nothing more than a housewife. But Komal is determined to prove them wrong. 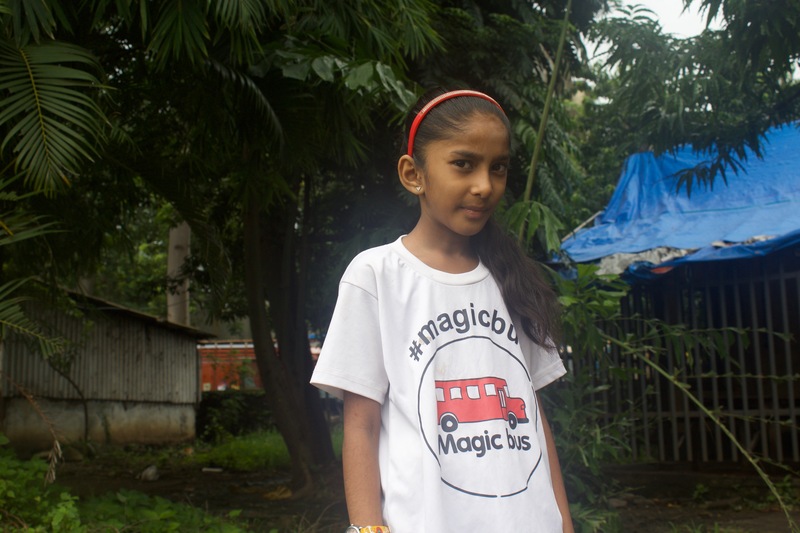 Komal joined Magic Bus eight years ago as an extremely shy child. Very quickly, she blossomed into an enthusiastic young woman thrilled about her future. She would show up to Magic Bus sessions ready to participate and learn something new. When she graduated from the program, she took on the role of a Magic Bus Community Youth Leader to help other kids in her community, Dharavi. She sets an example that they too can aspire for more. As a female, however, Komal faces significant obstacles from those around her — including some family members. Komal seeks out families who don’t allow their daughters to attend Magic Bus sessions and counsels them on why they should let their girls play and learn. Komal said she is lucky to have parents who are very supportive of her. Her father has always valued education. He was the top of his class in 10th grade, but could not continue his education in college because he couldn’t pay his tuition. Her family is not wealthy by any means. All six of them sleep on the crowded floor of their home, which floods up to their knees during monsoon season. They do not have a tap and only have 10 minutes a day to fill up water from the community spout for their entire family. Her father works as a day laborer only getting about four to five jobs a year, while her mother sells snacks on the local train. They pour all the money they save into Komal’s junior college fees. 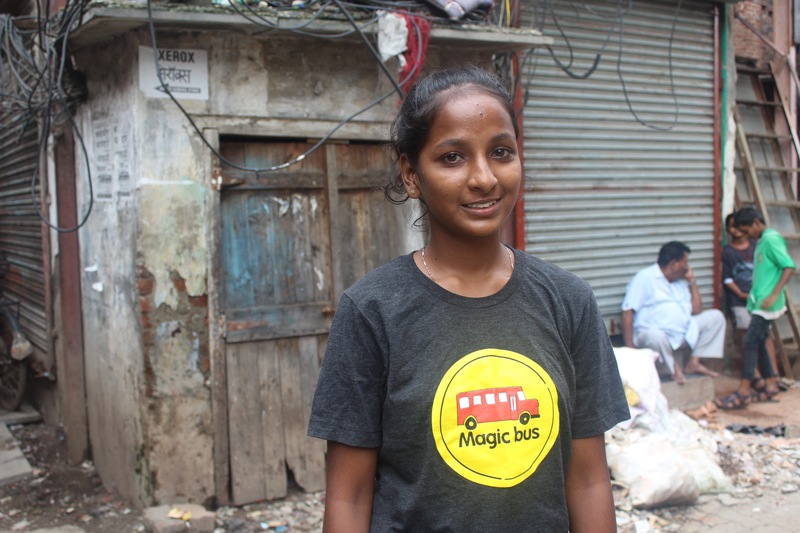 Komal is studying business at Chetna College in Bandra with the full support of her family and Magic Bus. Komal is on her way to completing college and landing a job in the formal sector in India, where she will hopefully be able to give back what her parents have given her. It is not common for girls in Dharavi, a slum community in Mumbai, to interact or play outside as they enter adolescence. Sixteen-year-old Harshali Koli is breaking the mold. She wants to be a physical education teacher. Ever since joining Magic Bus eight years ago, Harshali has developed a passion for health and education. The weekly activity-based sessions gave her an opportunity to play and learn with her peers — girls and boys. Although Harshali’s mother was always supportive of her involvement in Magic Bus, her father, a railway worker, was very much against it. Harshali knew she had athletic talent, and she decided to use it for good by mentoring youth in her community about the benefits of health, hygiene and physical exercise. From there, Harshali created a supervised program to play sports and games with the children in her community. She really liked playing with the kids, but in terms of a career, she had always been set on getting a traditional office job like many of her friends. “I wanted to go into business, but I wasn’t very good at math,” Harshali said. Her older brother helped her realize she can make a career out of her passion. She will start junior college in 2018 and plans to study physical education. Harshali will be part of the 87 percent of youth in college in India, and all because Magic Bus helped her realize and achieve her dream. Diksha Singh had no idea of the life ahead of her when she moved to Mumbai from a small village in Uttar Pradesh. Although she was born in Mumbai, Diksha’s mother developed severe lung and heart issues and her parents sent her as a baby to live with her maternal grandmother halfway across the country. She finished 10th grade in a government school and then reunited with her family in Mumbai to attend junior college. 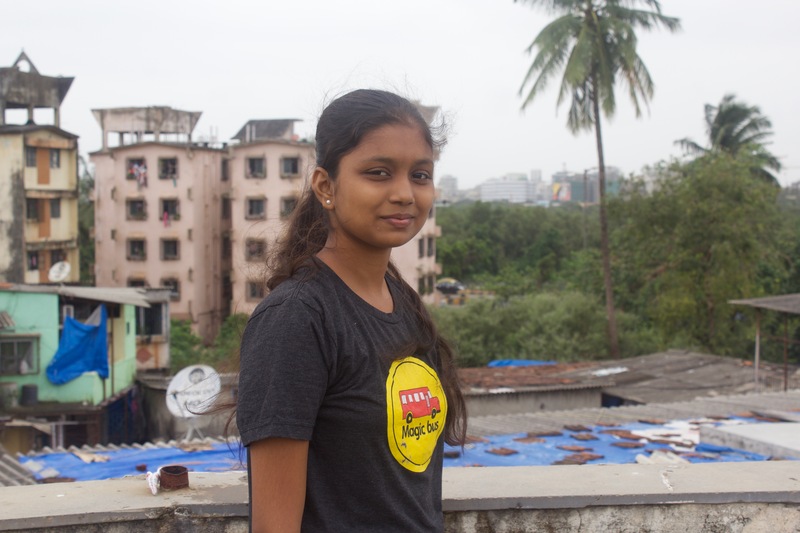 She said she was terrified of the big city, and she was dismayed to find unsavory living conditions in Dharavi, one of the biggest slum communities in Mumbai. Diksha and five other family members, including her grandmother and uncle, share a one room home that also serves as the kitchen and bedroom. Diksha also had a difficult time in junior college, where she was treated poorly because of her background. On top of it all, Diksha’s family was facing a financial crisis, and she felt like she needed to get a job immediately to help. After a year of searching, she was still turning up empty handed. Discouraged, Diksha felt like she had very little options left, until she met a friend who introduced her to Magic Bus. Her friend went to the Magic Bus Livelihood Center in Dharavi for a three month program, taking practical courses such as computer skills, English literacy and learning how to master an interview. In addition to valuable social interactions, Diksha said she was groomed for interviews, which was one of the biggest challenges for her in attaining a job. 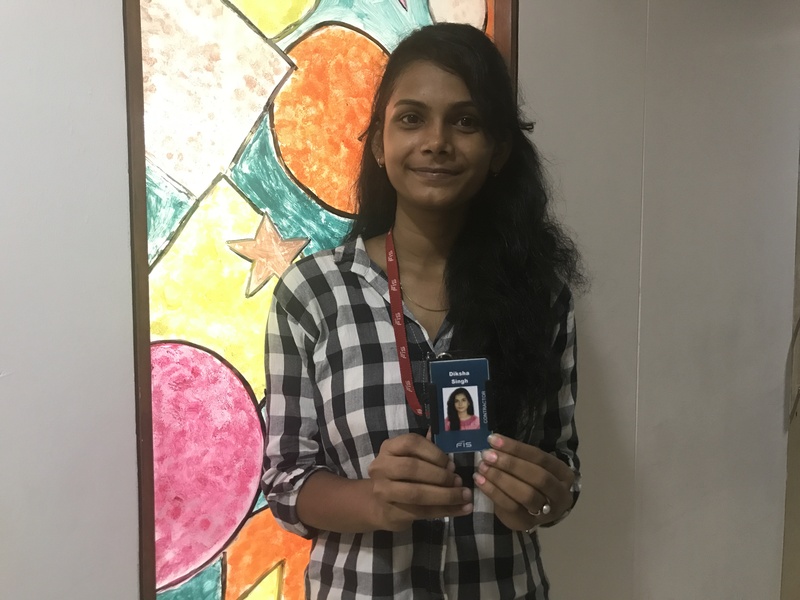 Magic Bus arranged a job interview at Fidelity National Information Services (FIS), a financial company, where Diksha was selected as a data entry employee. At 20 years old, Diksha is thrilled to have her first job, where she works 10 hours a day for about $150 a month. When Nazmeen was born, her life was laid out for her: learn how to cook, get married and have children. She wasn’t given the option of anything more — but despite her background, she fought for independence and education. When she was very young, Nazmeen’s family migrated from their impoverished village, Bihar, in search of better opportunities in Delhi. Her father found work, but only as an ice cream vendor with very little income. As a result, the family of five lived in Anand Parvat, a Delhi slum cluster, going days at a time without food because her father spent most of his income on alcohol and gambling. Nazmeen’s mother made the difficult decision to leave her husband, who was not fostering a safe or healthy environment for their four children, and began working as a maid. Nazmeen’s eldest siblings had to drop out to help earn money for the family. Nazmeen enrolled in school when she was six. The older she got, she began to witness her mother’s financial burdens and felt pressure to drop out to contribute to the family wages. “My family was worried I would become ‘too educated’ to get any groom,” she said. Without telling her family, Nazmeen used the money in her bank account from a government scholarship to fund courses at Delhi University. Her secret was short-lived, however, when her mother asked to use money from her bank and found the money was gone. Her mother was very angry and upset. Soonafter, Nazmeen was thrown a lifeline by Magic Bus, which recently began programming in her area. She was offered the opportunity to become a Community Youth Leader to teach children in her community the importance of education through the Magic Bus activity-based curriculum. Despite her passion for the project, her family forbade her from doing the work she cared about because both boys and girls were participating. Discouraged, Nazmeen resigned from the position, but stayed in touch with Magic Bus staff who introduced her to Magic Bus’s Livelihood Center in 2015. Magic Bus’s Livelihood Program provides classes for young adults such as life skills, computer lessons and English literacy, but Nazmeen quickly became exhausted after a few months. Nazmeen shared her fears with Magic Bus staff, who went to her home and negotiated with her mother to allow her to have a job because she would be independent and could contribute to the household income. “I have never received such support from anyone in my life,” she said. As a result, Nazmeen got her first job at a bank, making about $155 a month. Her mother was finally happy with her daughter’s achievements, as Nazmeen was able to give a portion of her salary to support her mother and siblings. 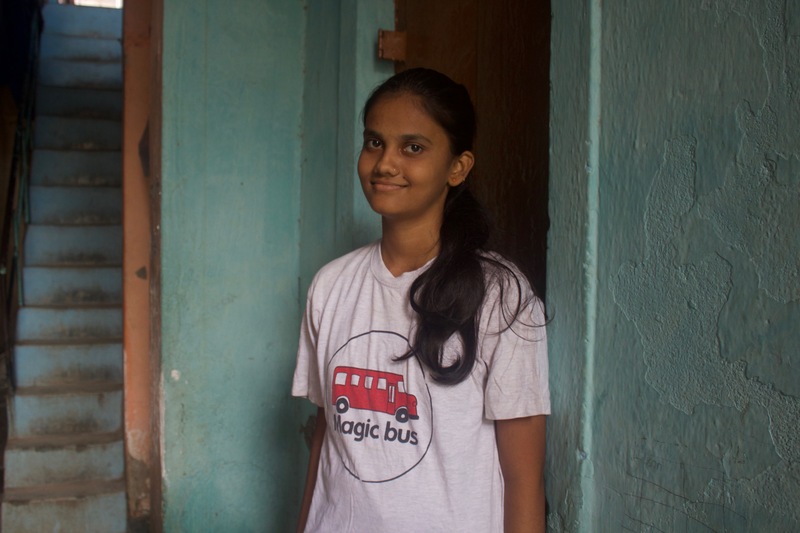 Nazmeen is one of the 400,000 youth enrolled in Magic Bus programming across India. Because of the support of Magic Bus staff, Nazmeen was able to break out of the cyclical expectations of her family and community and follow her dreams. This story was rewritten and adapted for a U.S. audience from a previous report in 2016.